Fishing Getaways (formally Corporate Fishing Charters} started over 21 years ago to represent one charter boat in Victoria specializing in the corporate market. Since then, we've gone through a variety of changes, but the principle of the business is still to “put you on the right boat, in the right place, at the right time to catch your dream fish". This may be a Snapper in Port Phillip Bay, a Marlin in the Pacific Islands or a mighty Barramundi in the Northern Territory. We offer a wide range of choices to suit many tastes and a booking service which is backed by many years of experience within the industry. Even with the expansion of our destinations throughout Australia and the South Pacific we have fished with the majority of our guides personally, so we know that they meet our very high standards and you can be comfortable that you are fishing with skilled and qualified operators. 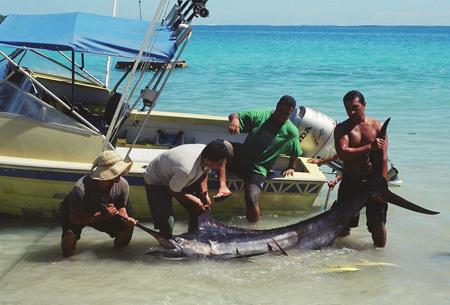 Members of Fishing Getaways have worked closely with tourism corporations within the South Pacific over the last 8 years to develop their fishing industries to Australian standards, which we consider to be quite an achievement. We work very closely with international tourism associations in many different ways helping to promote their recreational fishing industry. This can vary from simply journalism, assistance at shows to review of operators to ensure they are up to acceptable standards. 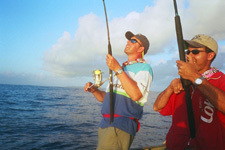 Fishing Getaways cater for individuals, groups, families, social clubs, angling clubs and corporate functions and have access to a large number of boats throughout Australia, the Pacific Islands.